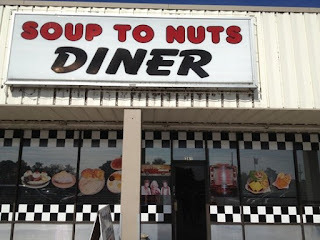 Chef Robert Irvine visits Soup to Nuts Diner, Tavares, Florida, where he finds owner Sharon Whitmore who has been running a 50's style diner for 10 years and for the last 4 years she has been losing $1000 a month and has had to put her house into foreclosure. The dining room is covered in dust, the kitchen is caked in grease and raw meat is stored incorrectly, Robert shuts down the restaurant and refuses to let anyone eat the food they are serving. The restaurant closed in May 2013 due to a poor reputation for food hygiene, high taxes and struggles to keep up with the mortgage payments, which led her to decide to move closer to family. Reviews seem to suggest that the food quality and service had improved after the makeover, although shortly after the makeover reviews were negative, possibly whilst they adjusted. There was a short term boost in sales of around 40% before the customers dwindled. This episode was episode 12 of season 5 and was aired on January 02 2013, there were 13 episodes in the season, airing between November 2012 to March 2013 and the season 5 closure rate currently stands at 93%.